During this series we will work on a cute little ladybug. Just click on the image below to find the enlarged image of the pattern. 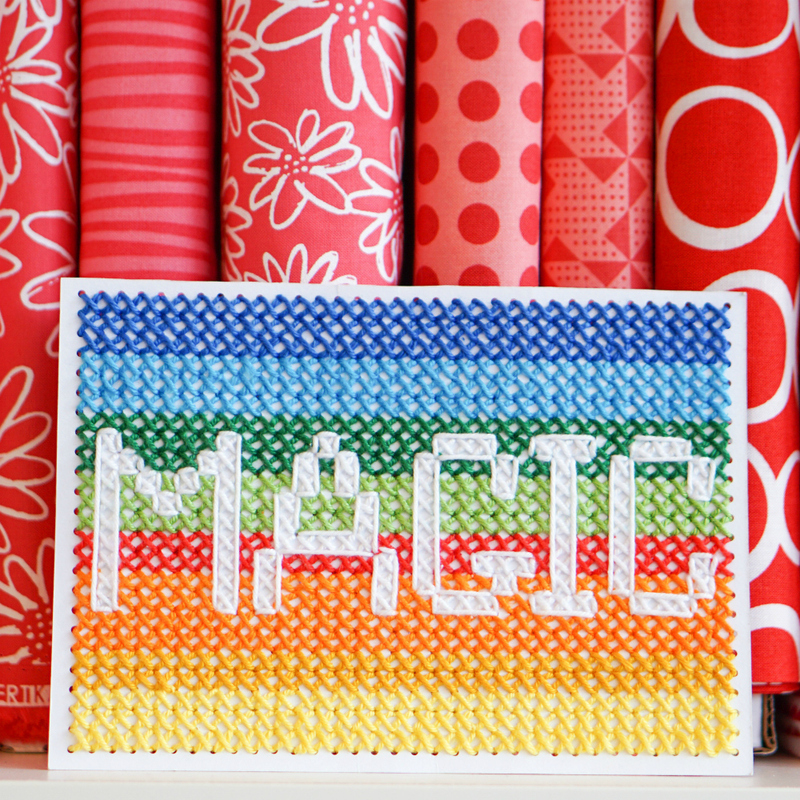 I hope you follow along and enjoy your first steps in cross stitching. Lets thread our needles and get started! We will start by stitching the row of stitches marked in the picture below. 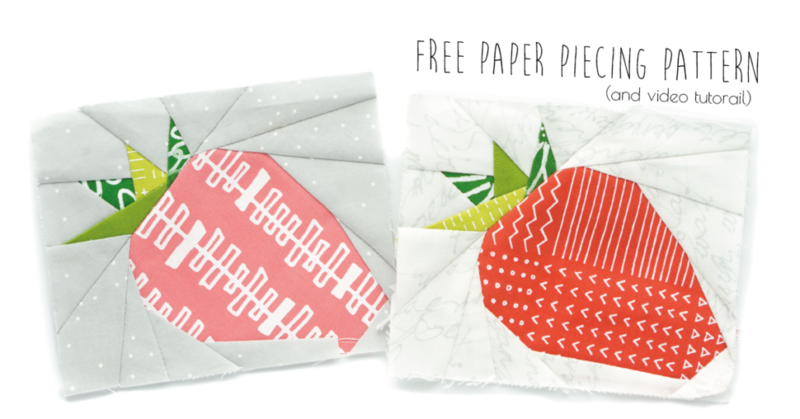 These will be stitched in DMC cranberry pink (601). 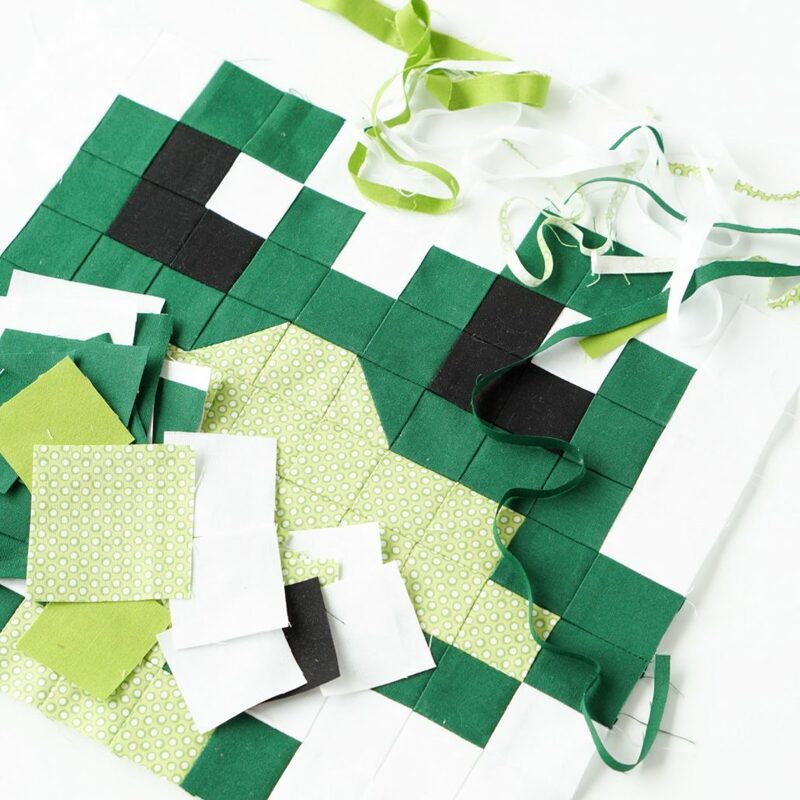 Each square in the pattern will be one cross stitch on your fabric. The little arrows in the green spots mark the center of the pattern. 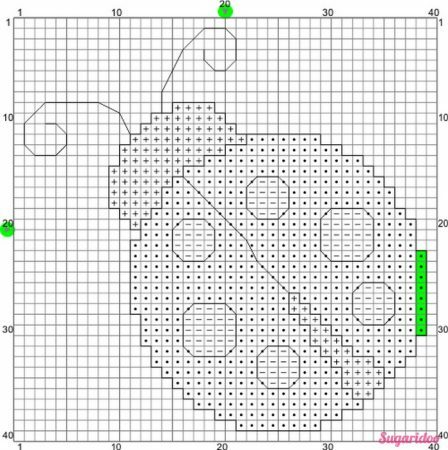 This ladybug pattern is a small design, so we will count from the center of the pattern to the stitch at the bottom right. That will be 19 squares to the right and 10 down from the center of the pattern (1). You don’t have to be very precise, just about 19 and 10 stitches will do. 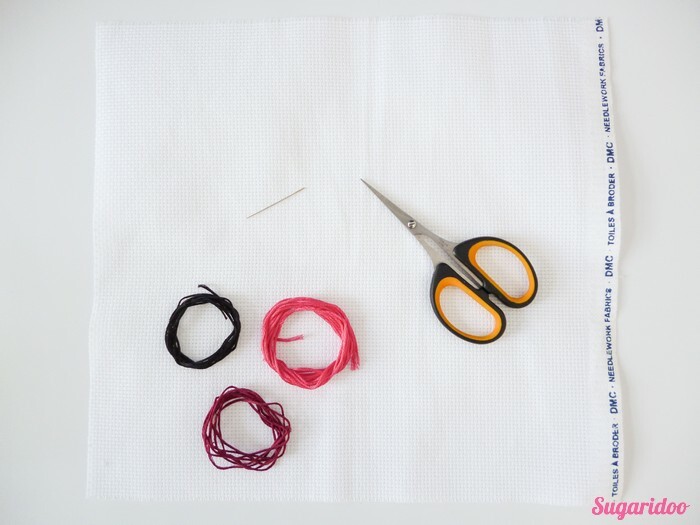 Bring your needle from the back to the front and leave a tail at the back of the fabric (2). Now it is time for the first stitches! 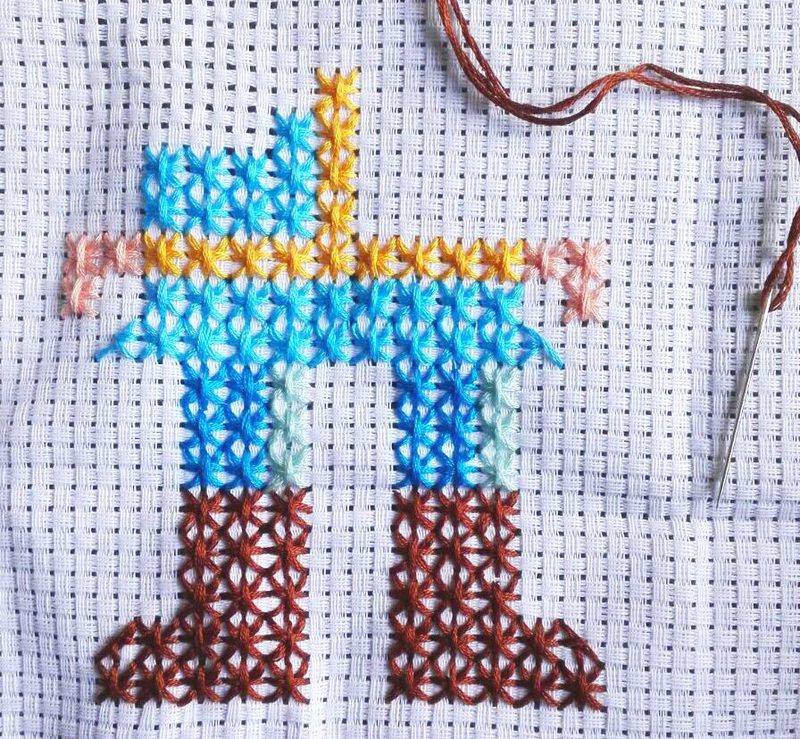 I learned to cross stitch in columns up and down. 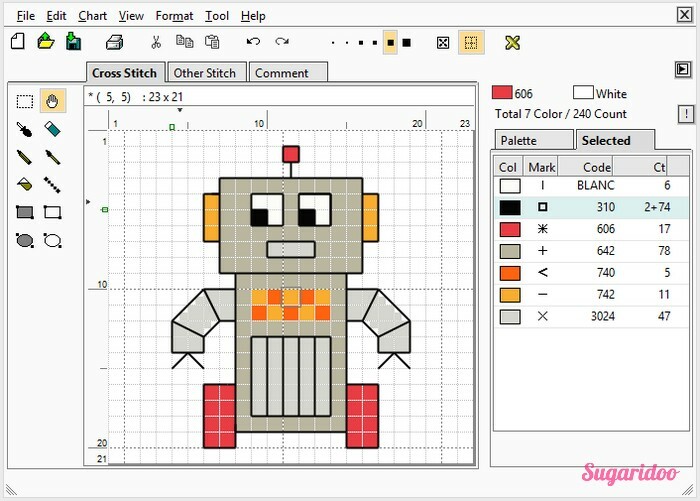 This is not the only way to cross stitch, it’s just one of the options. You can also stitch from left to right, right to left or down and up ;). The following schematic drawing shows how to make four cross stitches going up and down. Now we’ll move to our ladybug. The place where your thread comes out of the fabric at the front is the bottom left of the first cross (3). We will first make eight half crosses in one row up (3-8). And in the same way we will make eight stitches down (9-14). When you’ve done a few stitches you will see that it’s not that hard at all! 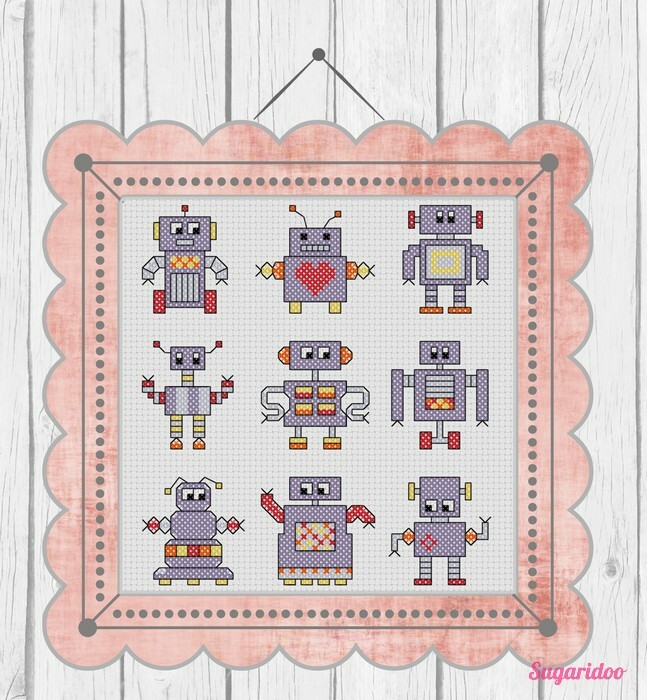 And there they are, you have made eight nice cross stitches! Now we finished our first row we can fasten of the tail at the back. At the back of the fabric you will see horizontal stitches (15). To fasten of the tail just pull it underneath the stitches (16) and cut off the end (17). There it is, your first row of cross stitches! 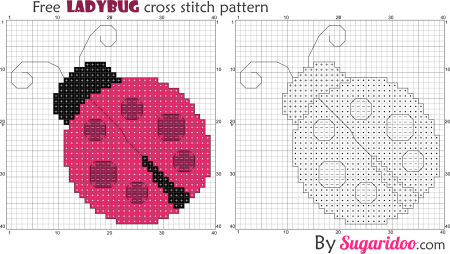 In our next post we will finish all of the cross stitches of the ladybug. So nice that you are stopping by at this introduction to cross stitching. 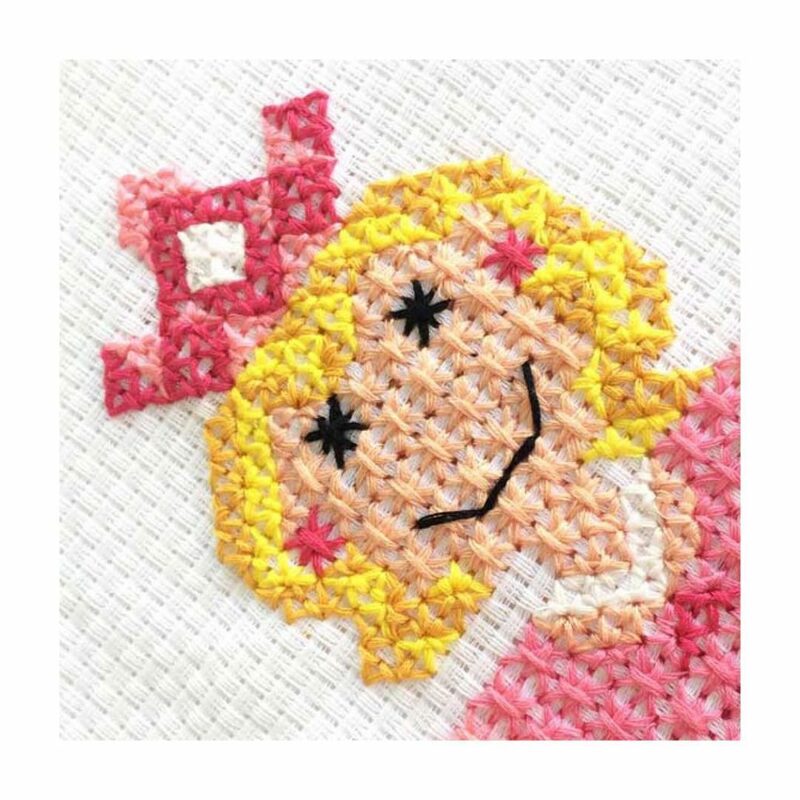 This week I like to share some basics about cross stitching, so we will have a small series on learning to cross stitch! So what will we need to start cross stitching? 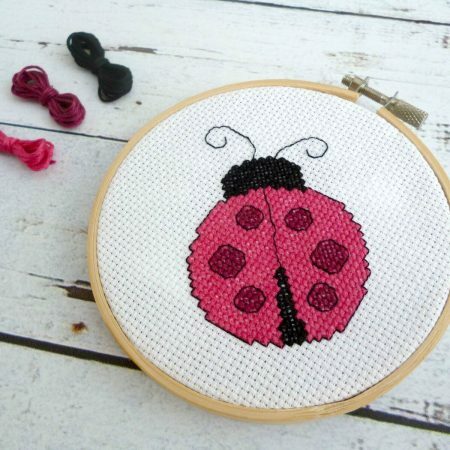 To cross stitch this little lady bug we will need a piece of embroidery fabric. 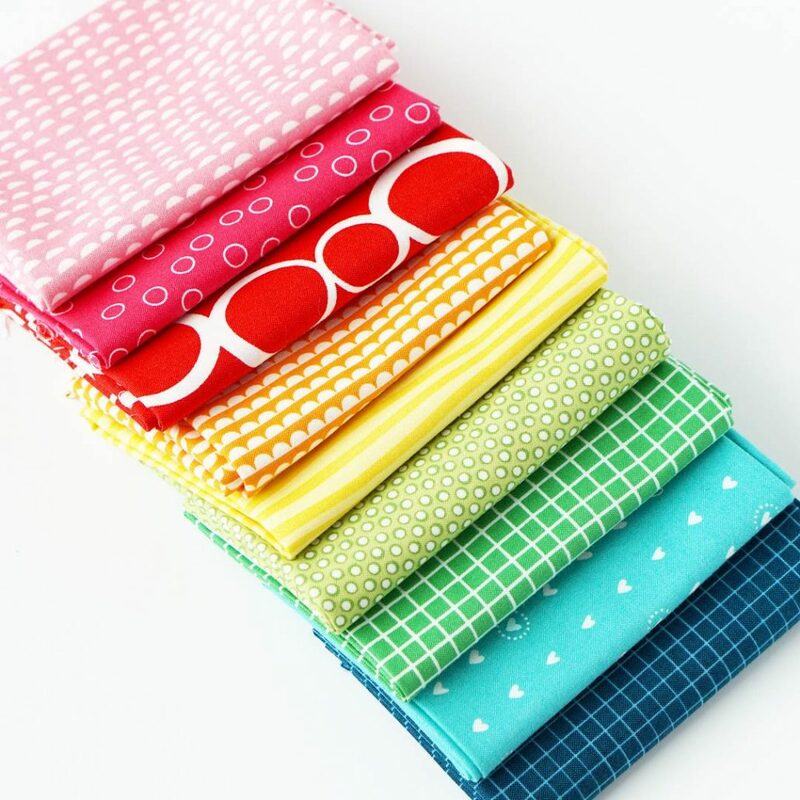 On aida 5.5 blocks/cm (14 count) the design will be about 7.2 x 7.2 cm (2.9x 2.9″). 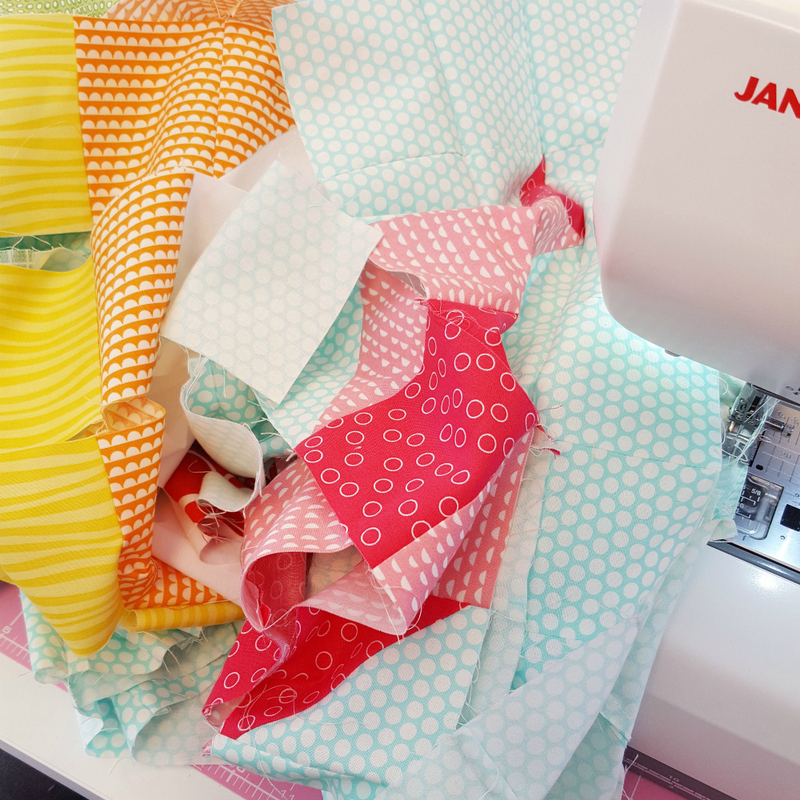 Make sure to take a larger piece of fabric, that will leave all options open to frame your work or use it in any crafty project. Secondly we will need some yarn. For this project DMC was used in the colors black (310), cranberry pink (601) and dark mauve (3685). We will need about 1 m of black, 1 m of dark mauve and 2 m of cranberry pink. Embroidery floss consists of six treads. 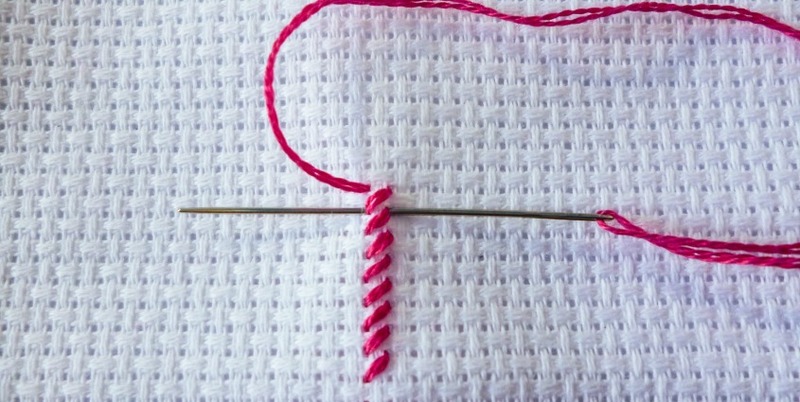 Usually we will use two threads for cross stitches and one thread for back stitches. 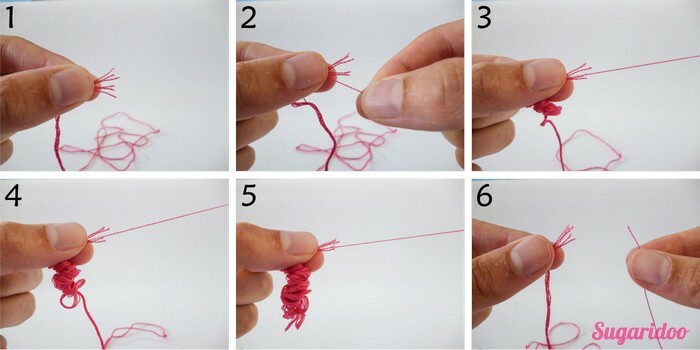 To pull one thread out of the floss, hold the strand between your thumb and finger (1). Take one thread and pull it all the way out (2-6). Just take one thread at the time, when you take two, the strand will tangle up. Before we start we will find the center of the fabric by folding it. This way you your design will always end up in the center of the fabric. 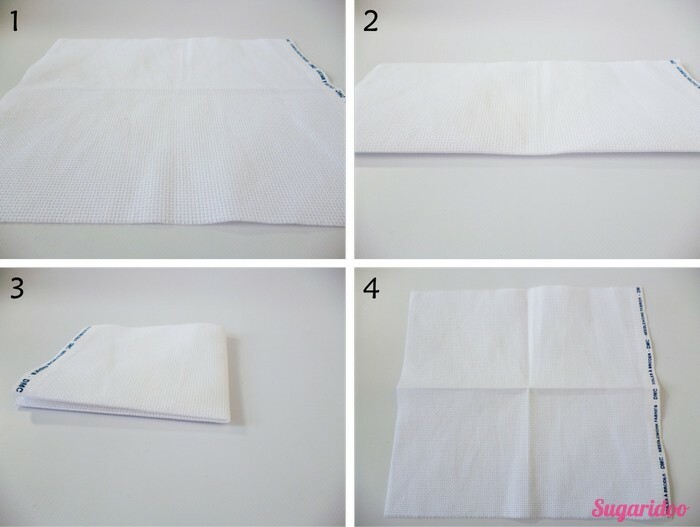 Just fold the fabric twice and you’ll have your center stitch. Most pattern will mark the center of the pattern with small arrows on the side. 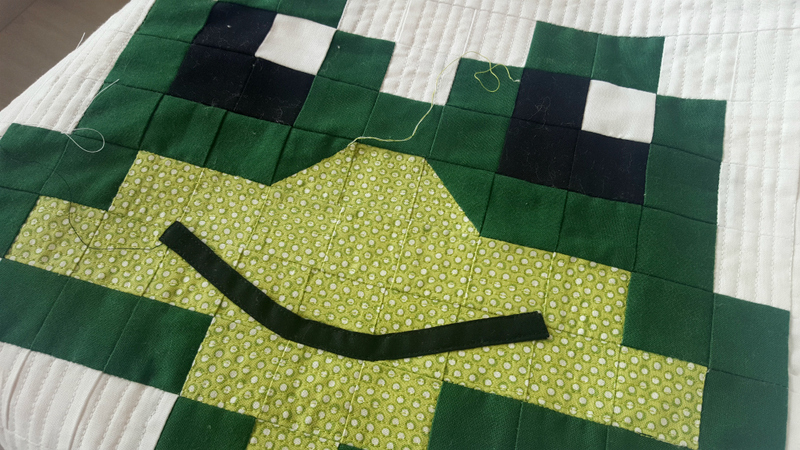 When you start stitching you can start with the center stitch of the pattern, or you can count your way the the side of the pattern. I like to use this second options for small designs. With big designs I work my way out from the center. We will start stitching the ladybug tomorrow! Yay :) Hope this was helpful so far. 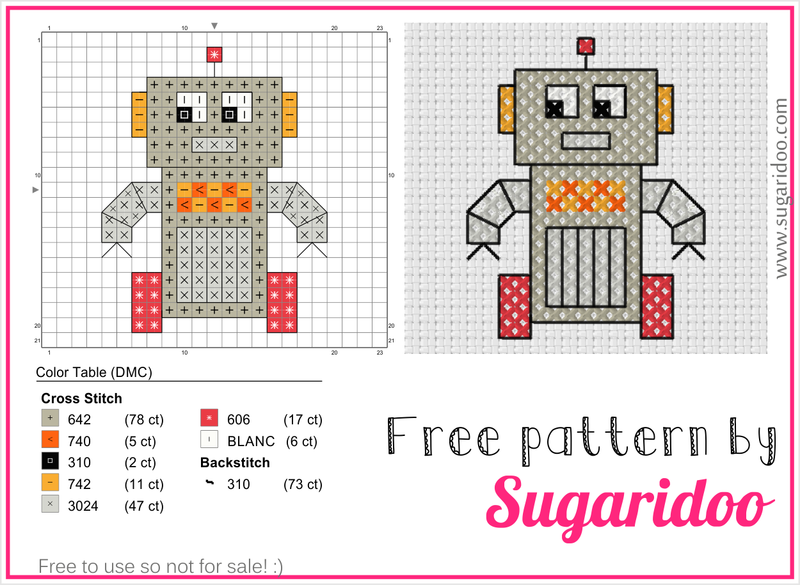 In the next posts we will make cross stitches, back stitches and learn to follow a pattern! Do you wanna make you own Pinky? 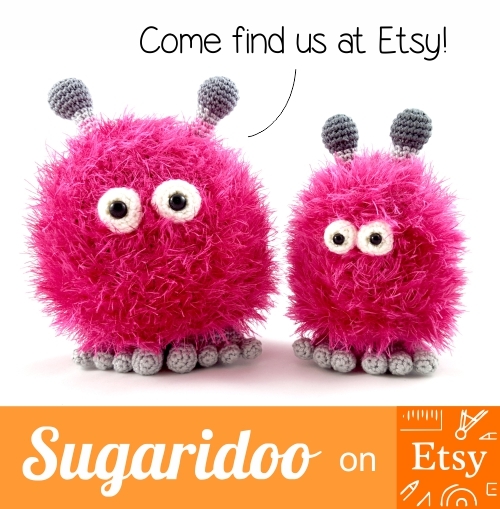 You can find the pattern in my shops on Etsy and on Craftsy. 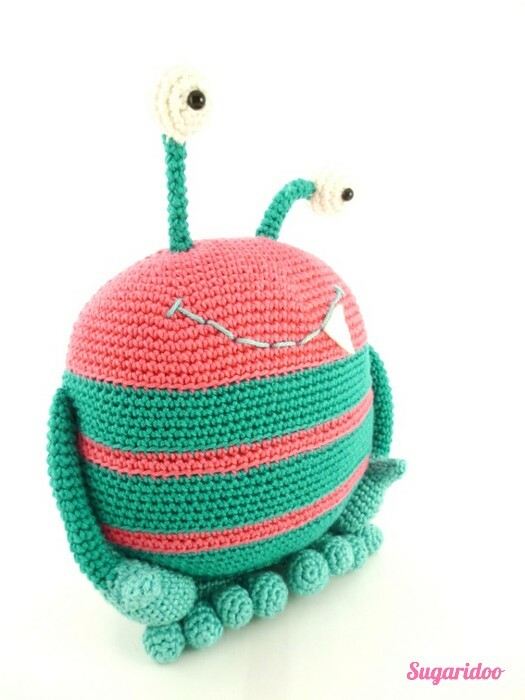 I would love to see your version of Pinky if you are going to make him! Those feet! Aren’t they the cutest? I love how they turned out. 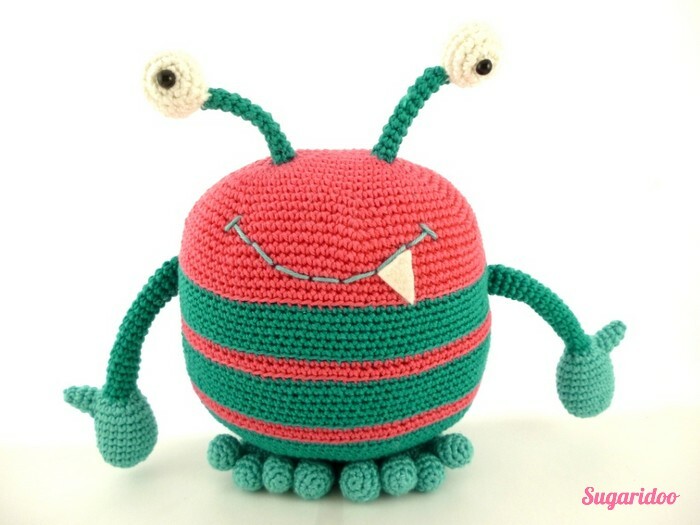 It’s always exiting to see a design on paper turn into a real crocheted toy! 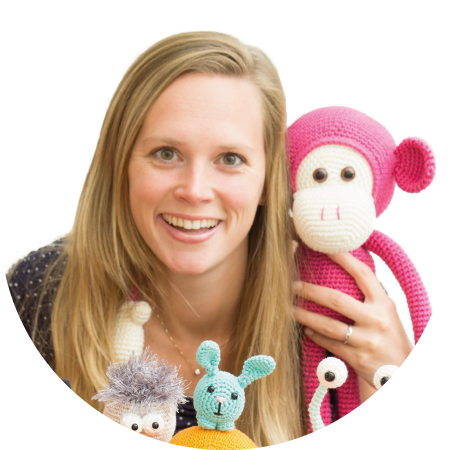 When you are going to make Pinky and have any questions, don’t hesitate to ask. I’m happy to help along the way! One more close up of his feet. Sewing everything together is actually my least favorite part of making a toy. Strange isn’t it? Only by putting it together you’ll get to cuddle your monster. But still sometimes all the part will lay around in the house a long time before I will finish it. Summer is on the way! Lovely weather and all those beautiful colors outside. 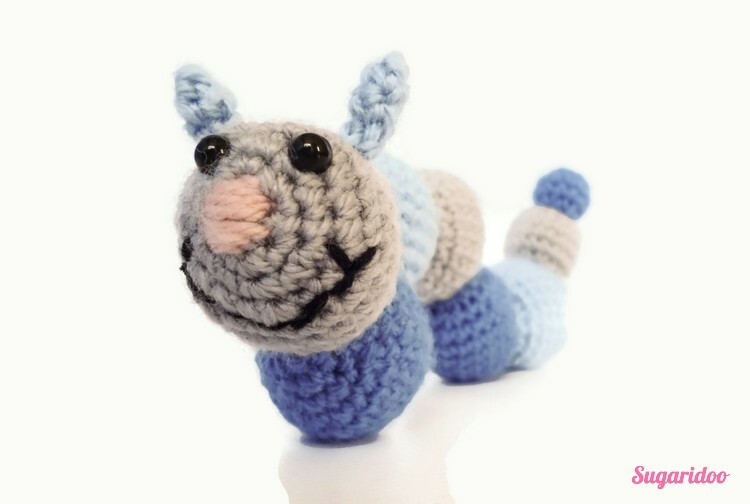 This cute caterpillar will fit right in don’t you think?In this blog post you’ll find a free pattern to crochet him yourself! Are you ready? 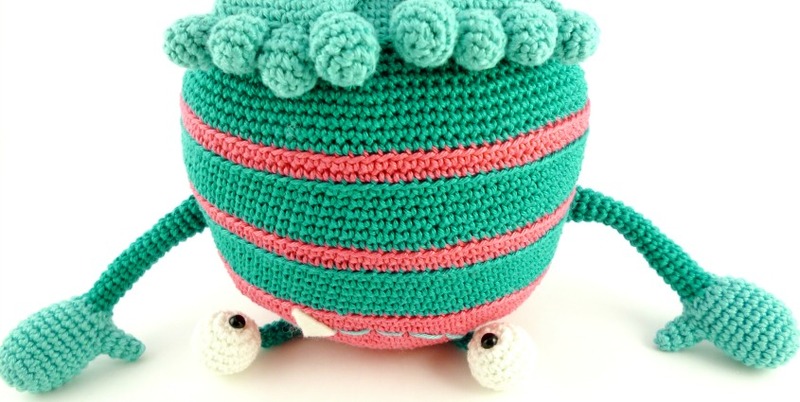 Lets start crocheting. Finish off and leave a tail to be able to sew the balls together later on. Place the safety eyes between R3 and R4 with about 3sc in between. Finish off and leave a tail to sew the head to the body later on. 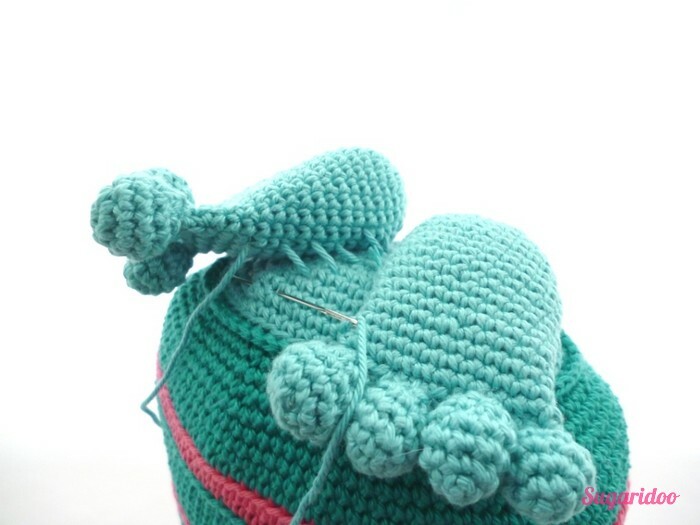 Fasten off and leave a tail to attach them to the head. Fasten off leave a tail to attach the tail to the body later on. Fill up the ball, fasten off and leave a tail. 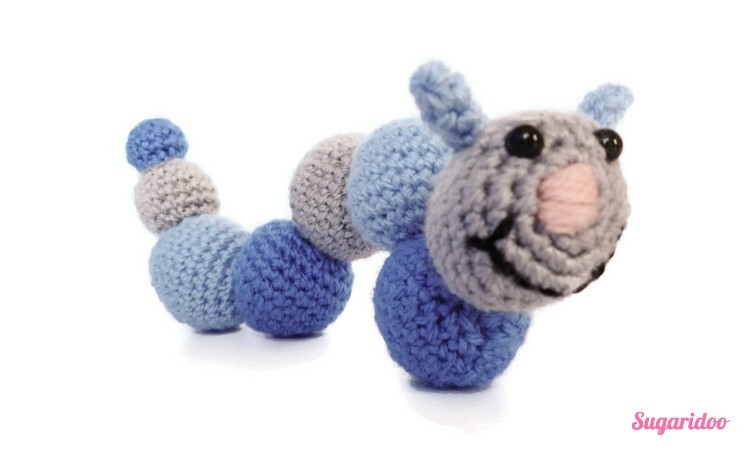 Sew the caterpillar together. 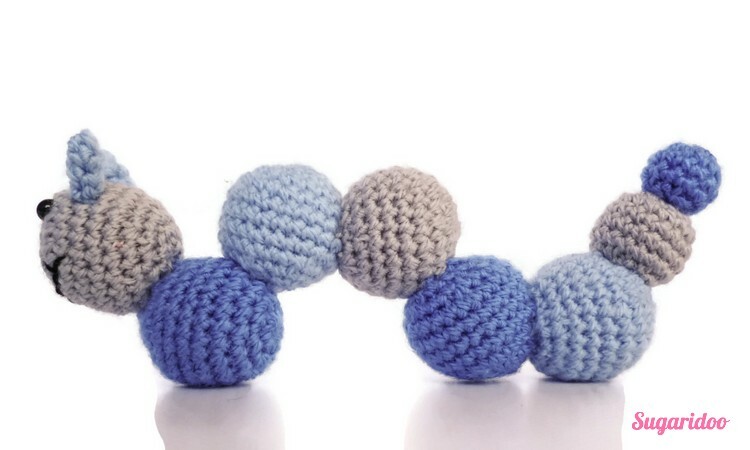 First you attach the five balls of the body to each other. 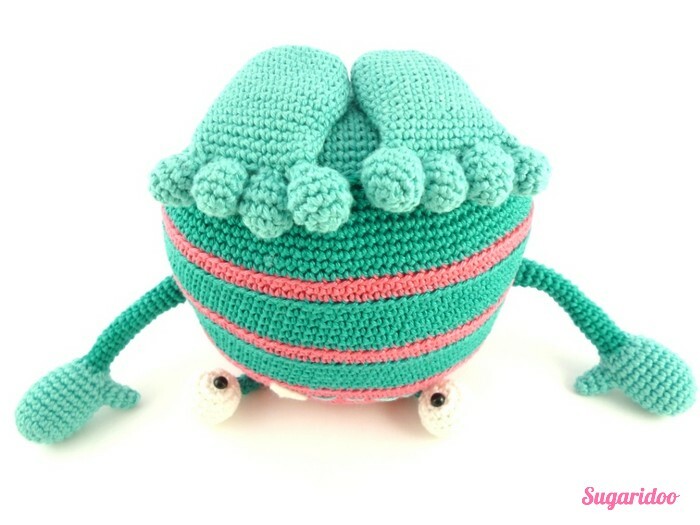 Then you can sew on the balls for the tail. Then the head with the feelers. 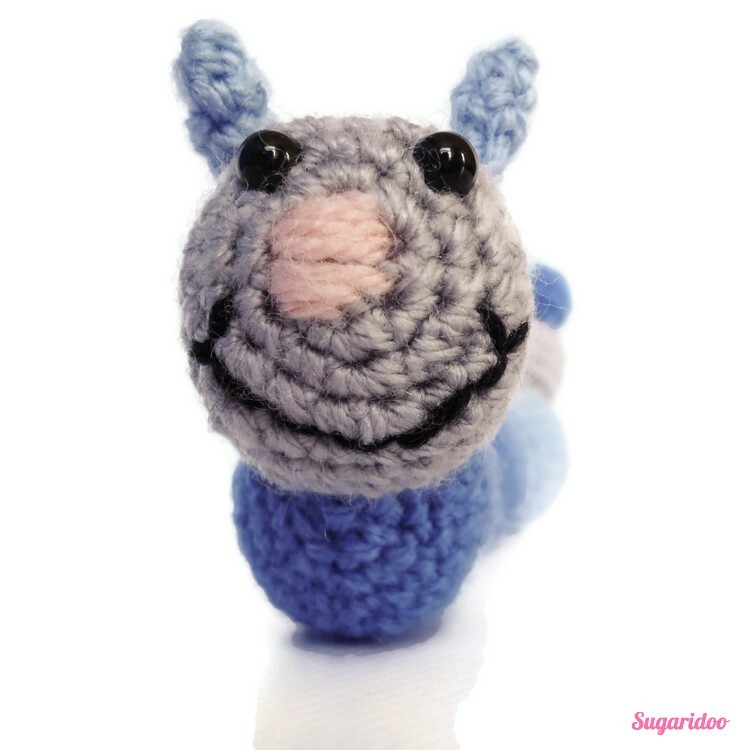 Now stitch on a nose with the pink yarn and a sweet little mouth with the black yarn. And you’re done! Wasn’t that fun? 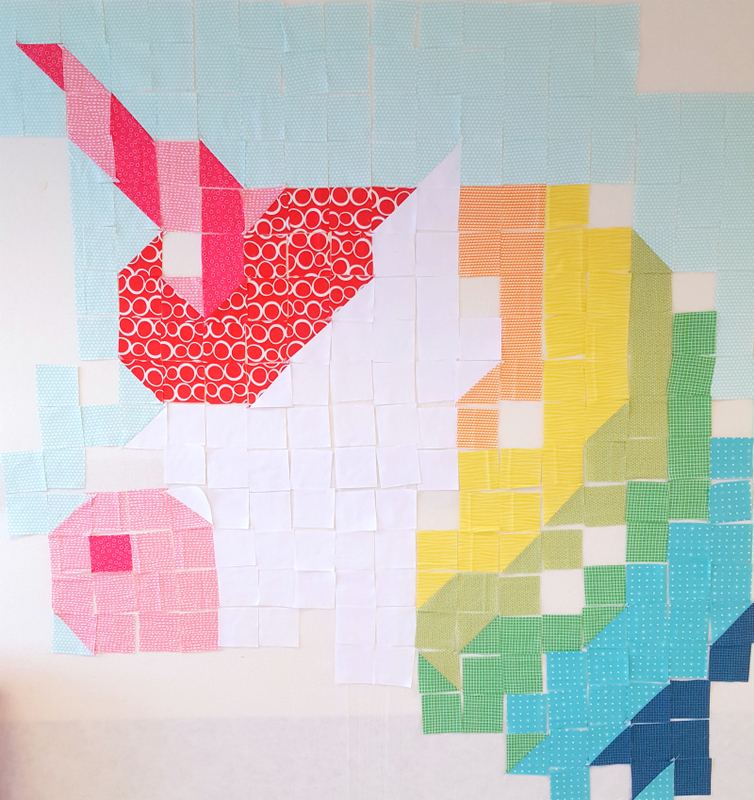 Go make another one in an other happy color!